History | The Reverend Anthony Jacob Henckel Family National Association, Inc. The Reverend Anthony Jacob Henckel Family National Association, Inc. is dedicated to the preservation and the education of Henckels (Henkel, Henkle, Hinkle, Hinkel, and other various spellings) family history and genealogy. The Henckel family is fortunate to have incredible ancestral records dating back to the year 1500 AD in Germany. Many of these records are attributable to their involvement in the Lutheran Religion and in the churches where the Henckels preached and worshiped. Anthony Jacob Henckel was born in Merenberg, Germany in 1668. He studied at Giessen University in Germany and was ordained into the Lutheran Church on February 28, 1692. The Reverend Henckel came to America with his wife and seven of their children and arrived in Philadelphia in September 1717. He was hired as the Pastor, of what was known then as the “Swamp Church” prior to leaving Germany, by The Frankfort Land Company. After helping, what is now, New Hanover Lutheran Church build a new church and school, Pastor Henckel helped to form and organized several Lutheran churches in Pennsylvania including: Christ Lutheran Church in Tulpehocken, Goshenhoppen Lutheran, and St. Augustus Lutheran, then known as the the Trappe Lutheran Church. In 1721. Reverend Henckel helped to form and established St. Michael’s Lutheran Church in Germantown, Pennsylvania. St. Michael’s Lutheran Cemetery is where Reverend Henckel and his wife, Maria Elizabeth Dentzer Henckel, are buried. The descendants of Reverend Anthony Jacob Henckel are divided into branches designated for each of his seven adult children who migrated to Pennsylvania in 1717. These descendants who are now scattered across the United States continue to research, celebrate, and share their rich heritage through the work of Reverend Anthony Jacob Henckel Family National Association, Inc.
Anthony Jacob and his family, before leaving Germany for America, were promised by the Frankfort Land Company 500 acres of land in what is today New Hanover, PA. The land in New Hanover was called “The Swamp” by German immigrants who were already living there. We must understand that the German definition of “swamp” is a place with fertile ground that is suitable for farming. As Anthony and his family discovered upon arrival the land was anything but a “swamp”. It was some of the most fertile farmland that had been discovered in America at that time. Past history of the area has lead us to believe that the areas first church was started by Daniel Falkner around 1700. Current history, written in a two volume series entitled “Pastors and People” by Dr. Charles H. Glatfelter, the most respected historian of religion in Pennsylvania, corrects this misconceptions. According to Glatfelter, when the Henckels arrived in September 1717, Anthony Jacob, began to organize the German Lutherans, already in the area, into a congregation. During 1718, 50 acres or land was given to the Lutherans and a new church was built. The log structure took until about 1722 to complete. The new church was known as “The Swamp Lutheran Church”. Anthony Jacob was pastor of the congregation from 1718 until his death in 1728. During his 10 years in America he organized and formed numerous Lutheran congregations throughout the aea. Towards the end of his life Reverend Henckel was helping to establish St. Michael’s Lutheran Church in Germantown, PA. He would attend meeting and conduct services in Germantown as part of his work. During the 40 mile horseback ride to Germantown, which would take a couple of days, he would stop along the way to minister to other Lutherans. On his last trip, while returning home, his horse threw him. He died the following day at Herman Grotehausen’s home. Grotehausen was a devout Lutheran who was helping Reverend Henkel to build the new church, which finally was complete in about 1732. Today the two friends are buried about seven-five feet from each other in the churches cemetery. In studying the history of St. Michael’s Lutheran Church, we recently and ran across a website for The Germantown Historical Society. 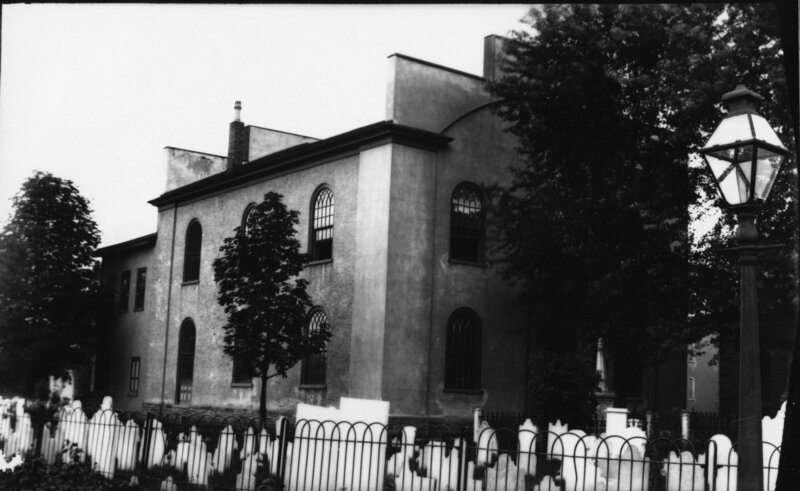 On the site, we found all kinds of great information on Germantown’s history, fantastic homes that remain from the 17th and 18th Century, and we were able to purchase a picture of the second St. Michael’s Lutheran Church. The first church was completed in about 1732, after Anthony Jacob’s death. The church was enlarged in 1746, and the second church was built in 1816 and demolished in 1865, to make room for the current structure completed in 1896. The picture below is from 1865, right before the second church was demolished. I wonder what they did for a church during those 31 years? My grandmother, Helen Felix Smith,(my father’s mother), goes back to the Hinkle family. Catharine Hinkle is her 3rd great grand parent. John Justus Henkel was her 4th great grand parent. Ending back to Anthony Henckel which is her 11 great grand parent. John Justus Henkel lived in Manheim Twp, York county. PA. Manheim is only a few minutes away from where I live. I live in Hanover, pa. John Justus is buried at Mt. Olivet, as the same as my grandmother, Helen. Thanks for telling us about your connection to our family. I hope you will join our Association and can attend our 2017 Reunion in Germantown, PA, it is not far from you!It would be great to have someone in the Association, so close to where the Henckel family first settled in America. I was helping my daughter on an immigration project for school and it appears as if we are Henckel descendants. The Rev. Anthony Jacob Henkel and Maria Dentzer were my 8th great grandparents. My 5th great grandmother was Elizabeth Henckel Crites. Elizabeth Henckel was the daughter of Jacob Henckel and Maria Barbara Dieter. Elizabeth married Jacob Crites making their son John Crites my 4th great grandfather. The remainder of my line is as follows: Isaac Crites-3rd great grandfather, William Crites, great-great grandfather, Tennie Crites Crane, great grandmother and Ethel Crane White, grandmother. I’ve enjoyed discovering this information and look forward to a future road trip to see the Hinkle’s Fort marker and St. Michaels in Germantown. Hi Lisa, welcome to our family of Henckel/Hinkle. I have seen that historical marker you speak of and have pictures taken beside it…was fortunate to have a Hinkle descendent who lived just a couple miles from it to take me there. The area is quite beautiful and is actually called Germanytown. To get there I had to travel through what is called “Judy’s Gap” which also has a historical marker and is outside of Franklin, WVA….the Judy’s are also descendents of mine which made my trip even more eventful. So glad I found this site last year and always look forward to receiving e-mails from distant relatives. Have a blessed day. If anyone from Branch VI reads this please contact me at jameshinkle32@yahoo.com. I have been filling in everything I can from wives/children/siblings of everyone I have on my family tree so any extra information would be great. I loved finding this site and have started to really enjoy talking to Richard. I hope to have my full lineage researched for my boys and this has helped so much. Captain Charles A. Hinkle Sr. > Maj. Charles A. Hinkle Jr.>Casper Hinkle> Dr. Charles Edward Hinkle>Jesse Creason Hinkle>William Thomas Hinkle>James Thomas Hinkle>James Michael Hinkle(me)>Peyton James Hinkle(my son) Preston William Hinkle(my youngest son). If what I have come up with is correct Charles A. Sr.’s father was Anthony Henckel a son of Rev.Anthony Jacob Henckel. Greetings. Words alone cannot express how thrilled I am to have found this site, even though I am not sure where, or even if, my line goes back to that of Anthony Jacob Henckel, even taking into account the fact that someone at sometime in my fathers family left Pennsylvania and moved to Michigan. Sometime prior to 2008, I was a member of Ancestry.com for about 2 and a half years, in the hope of finding information about where/whom I have come from. Over the years as I grew up, I heard bits and pieces about both sides of my family, mostly farmers and general laborers,but with a twist thrown in every now and then. On my mother’s side, they talk of a connection to Lord Horatio Nelson of England, and on my father’s side they talk of a link to the Great Cherokee Nation. While I know that research, especially of this nature, can take many years to sort through, it seemed that my time on Ancestry.com was going nowhere. On both sides of my family tree, almost all of the information I could find was one sided. On one side, almost all paternal information was missing, and on the other, the maternal, and then there was all of the POSSIBLE family connections. I will admit that I am not all that good at maneuvering/surfing the web, but when I came across a “possible family connection” that was labeled Constantine and dated circa 300-325, I figured it was time to give up. Now, after reading the information and comments on this site, and after going through family information (on both sides) which I have been able to locate through various -almost lost- relatives, I think I am ready to resume my search for my origins. I look forward to uncovering that which has been lost for far too long, and anticipate finding and connecting with the many many relatives scattered across the USA and the World itself. So exciting to see so many comments concerning this line. My connection comes through Susannah Margaretha Henckle who married Henry Miller II of Ephrata, Lancaster, County Pennsylvania. She is the fourth daughter of Johann Gerhard Henckle and Anna Catharine (whose last name we are still trying to figure out). Johann Gerhard Henckel was the fourth child of the Reverand Anton (Anthony) Jacob Henckel and Maria Elisabeth Dentzer. I sure would be intereted in any pictures, portraits or other renditions reflecting what these members of the family looked like. I love putting pictures with names and places. I am also interested in finding out more about the involvement in the Revolutionary War. I am technically 11 generations out from Anthony Jacob Henkel but through my adoption via my grandparents I ended up becoming 10 generations out. My 4th Great-Grandma Margaret Henkle married Jesse Woods and was part of the Henkel Train going out to Oregon and settled in the area around Benton County Oregon in the 1850’s. Eventually some of the Woods through Alvin Wood ended up in New Hampshire where my mother Sheryl Gloria Neff Fick was born in Concord. Her mother was June Charlotte Wood, daughter of Alvin Wood. My mom followed Grandma June out to California when she was 16 after living with her father and that is where she met my dad, Marvin Fick. They ended up in Eastern North Carolina via the United States Marine Corp in 1973 and we have been living here ever since. Their oldest daughter Katherine is my biological mom and allowed our parents to adopt me in 1987. It would be cool to know of any descendants who ended up in North Carolina especially in the eastern part of the state. Kathleen, thanks for your comments on the Henckel Family website. Your story is very interesting. My name is Richard Henkel and I am the Webmaster of the website. I live in Raleigh, so am close to the Eastern part of NC. There are quite a few members of our Association that live in NC, several from the Lexington and more from Hickory and surrounding area. If you are interested in learning more about your lineage we would like for you to join our Association and attend our Reunion. Details are included on how to join on the webpage. If you have not already done so and do not already own The Henckel Genealogy by Junkin and Junkin it is avaialable from the Association and can be bought on the website. If I can help you in helping you with your lineage I will be glad to try. Hello Kathleen, my Hinkles lived in PA., then migrated to N.C. My Great, great grandmother was Sarah Hinkle and her father was Anthony Hinkle. Sarah met John Hoover in N.C. and they moved to OH. after they married. They moved from OH. to IN.. Regarding John Justus Henckel’s revolutionary war service he was a patriot who built Henckels Fort in Virginia. If you want to see the Bible listing with the men who served with him go to hackerscreek website and there is more than enough information regarding his service. His signature is in the Bible. The Bible belonged to a Frenchman. John Justus supplied food, ground for drilling the troops, horses, blankets and other items to the army. This is a brief notation if you would like to know more let me know. There is a bunch of SAR links to the Henckels. Many of the sons, brothers, and inlaws served at the fort. John Justus moved from Carolina to escape the Indian incursions by the time of the American Revolution. He saw the land in Germany Village and called it the promised land. That is why he chose to settle there. Henckel Fort was the only fort left on that part of the Potomac after the Indians under Killbuck destroyed the other two forts. One being Fort Seybert. Killbuck talked the small amount of settlers, 30, who were in the fort into allowing him in. Once inside the indians killed or captured the settlers. Killbuck ordered his “braves” to stand behind about 10 survivors who were placed sitting down on a long log. On his sign Killbuck then had the “braves” hatched to death the 10 people on the log. They literally hacked them to death….Killbuck then took the children and the women who had survived to Ohio as captives. This is one of the worst incidents that happened. I have relatives on the other side of my family, who were not home at the time of the capture of Fort Seybert or I wouldn’t be here. This information is available on the hackerscreek site. Greetings, I first want to say that it is so important to have the HISTORICAL proof for any information that is being shared thru this site or any other site. I have spent a lot of time reading about the Henckles and why Anthony left Germany….so, I’m going to tell you the plain truth here…he was poor and left to find the riches of America. YES, I know everyone wants to proliferate the exile of Anthony from Germany because of religious conflict. Yes, things were very bad there at the time. There were 3 recognized groups Catholics, Reformed and Lutherans. HOWEVER, if you read “The Pastoral Years of Anthony Henckel 1692 – 1717” by Ann Hinkle Gable all will become clear to you. There are original documents from those years that have been meticulously transcribed including but not limited to the direct descendancy of the family. I found it to be an astounding record. I believe it is important not to copy what one seesjonline and assume it is correct and the truth because it may not be. Daily I see the mistakes made by one person and then assumed to be right by the next person copied and proliferated through out the web. Before you know it we are going to be related to a dinasour named Hinckle who lived at the zoo of a neohomosapian fossil….please, don’t go there! As I read this book I found Anthony a human being with human feeling to be a father who had to record in the church book the deaths of his children. As I read it I felt the pain and agnoy ofeach childs death and a father’s love for his deceased children. I could imagine these events in the perspective of this day and time. Therefore, I am going to copy exactly from this book the words Anthony recorded in the Kirchenbuch the book of the church. Imagine his heart broken and him standing there writing these memorials of his deceased…you can feel his love, his heartbreak and his love. Johann Melchior, their third child lived to be 10 years old. “On September 27  my little son has been changed from mortality and given a Christian burial on the 29th of the same month. May he rest in peace, and God will awake him to immortality, after that he had spent his life of 10 years, 7 months, 2 weeks and 3 days. “On December 22  my little daughter Benigna Marie followed her little sister and paid the debt of nature, and was buried in her little couch on the 23rd with a funeral sermon at the age of 1 year, 2 months, 3 weeks, 1 day. May they rest in peace. A fifth child, the youngest, Johann Philipp, born in Daudenzell on April 26, 1713 and baptized May 1, 1713, was not listed among the children at the time of his father’s death, but we have found no record of his death. He may have died in Neckargemund or in Pennsylvania. Johann Philipp’s next older brother, Jacob Anthony, must have remembered Johann Philipp because he named one of his sons Philipp. The fathers love for his children is shown in his record of their death. I can still feel his pain and love and belief in God and heaven even after all these centuries. I hope this sheds some life on the man we know as Anthony Jacob Henckel or in the Latin…which is how he signed his name Antonus Jacoby Henckel. Brenda I too have recently finished re-reading this book. Although all of the German names made it challenging I really enjoyed the personalized picture that was created. I can see now where I inherited the determination to stand up for what is right, even in the advent of persecution and poverty. I also see where I acquired the trait for determination and working with the people that I provide behavioral health services too rather than treating them as though they were below me. I also find myself thankful to this great ancestor for the desire that I have to seek out new knowledge and the ability to remain dedicated to my family. Happy to be a descendant of such a fine line through my maternal grandmother. Nice site. I also am a DAR member by a different Patriot. I plan to send in an application on John Justus Hinkle Jr. I visited the Fort Hinkle area in April when I flew out from California. Nice and green as it had gotten all our California rain. Thank you for recommending this site and for your continued efforts on behalf of the Hinkle descendants. My ancestors are John Justus, Sr., John Justus Jr., and Mary Magdalena who married George Ketterman. Thank you Suzan for this info…so according to this list there might be a problem with Abraham’s military service…they did say he furnished supplies along with Mary Barbara Teter (my 5th great grandmother). He must have been the one who ran most of Hinkle’s Fort while the other brothers were in the actual military. I will have to contact the DAR to see if this makes me eligible or not. But thank you again for this info, it is very interesting. Hope you have a great day. Thank you very much for the above listing of Hinkles, etc that have been approved by DAT or Hinkles awaiting approval once all information is provided and/or approved. Please contact Suzie at her e-mail address she provided above to discuss individual questions on the DAR. This is a list of Hinkles who are documented with service or noted further info. is needed by the DAR (Daughters of the American Revolution). Service Description: 1) CAPT WILLIAM MC CALLA, BUCKS CO PA MIL. Hi Susan, so glad to see you are a member of DAR….I have thought about becoming a member also, but didn’t know if I was truly eligible. But you have confirmed that by your statement. My ancestry comes from Anthony Jacob Henckle & Maria Elizabeth Dentzer, son John Justus Henckle Sr, son Abraham Hinkle, son Micheal Hinkle & daughter Elizabeth Hinkle. What do I need to do to get involved with the DAR? Thank you for your response. Hi Joan!! I’m thrilled that you contacted me about the DAR! My Patriot is Anthony Jacob Henckel/Hinkle III. He is the younger brother of your John Justus Henkel, Esq. It seemed that there were a number of the Hinkle boys that DID take part (documented) in the RW that are of your Abraham Hinkle generation. that would make those guys 1st cousins. Email me so we can communicate further and I will check the DAR system for your Abraham and we’ll go from there!! Both Anthony Jacob and Maria are buried on the left facing side of the main entrance to the church. Their headstone is fairly new and is legible. Sorry that you missed seeing it. We would love t have you as a member of our Association, we are always happy when we see Branch VI Henckels, we only have a few of them in the Association. Our meeting in 2017 will be at St. Michael’s in celebration when A.J., Maria and their family came to America. Thanks for sharing your connection to our family. Thank you for your information. Then I did see their resting place and took several photos of the modern stone. The windows inside the church were lovely and seemed to be in good condition. My Grandmother – Myrtle Florence Harbin Lind (1902-1975) who did so much of our family research in the 50s, 60s & 70s, said that Pfarrer Henckel’s robes were at St. Michael’s. Hopefully they were removed and wondered where they were now located. Any way of making a tab for photos to be shared with everyone. I’d love to share my German photos – if I can find them!! And of St. Michaels!! My check will be in the mail on Monday!! I’m Suzan Persons and belong to the DAR through Anthony Jacob Hinkle III as my Patriot and his son, Wendel Hinkle as a supplement. I belong to the 6th branch. My Henckel/Hinkle # is #62157372. We lived in Heidelberg, W. Germany in the 80’s and found his three churches where Pfarrer Henckel preached. This past week, I finally made it to St. Michael’s Lutheran Church in Germantown, Pa. I have a few photos on my web site of the inside. I was not able to find the graves. I was told that the head stone for Maria Elizabeth Dentzer Henckel was still there. So many are not legible. Suzan, I find it interesting how when I lived but a few miles from St. Michaels I would go and was able to find the headstones but was never able to get into the church itself. Everytime that I went to visit the building was locked up and nobody was around to let us in. I would love to see the pictures of the churches where he and his father preached in Germany. The pictures that I have seen come from a Henckel website and the book. How might I access your website to see the pictures? Also, were you able to obtain headstones of our one ancestor (can’t remember if it is Georg or Casper) located in the foundation of one of the churches in Germany? I would love to see them also. I’m not sure if it will connect you to the link, so you may have to copy and paste it in. Scroll down to June 25th 2014. I do have a picture of the Henckle Grave stone without realizing it. Anthony Jacob Henckel is the very beginning of my Hinkle family tree. My grandmother was Effie Hinkle Engle. Forgot to state Sarah and Micheal are my 4th g grandparents. Reverend Micheal Hinkle b 1774 d in Germany 1852. If anyone can elaborate on this it would be greatly appreciated. Oscar Judy and Glenna Judy Kesner are buried over on Rough Run close to where the Bergs live just up the road from where my great grand parents lived (Hubert “Hood” Mongold and Myrtle Riggleman Mongold). The plot is up on the hill to the left and close to David Mongold current house. Thank you for the info, it gives me a good starting point for my application to the DAR. Hi, this is my second e-mail on this site, the first identifying my lineage from Reverend Anthony Jacob Henckle through John Justus, Sr.. I am curious to know if his son Abraham Hinkle. (my 5yth ggrandparent) was in the Revolutionary War also, if so, it would allow me to join the Daughter’s of the American Revolution as a direct descent. Thanks for you help…. The answer is probably yes, since both him and his wife, Mary Catherine Teter lived at the Hinkle Fort in Pendleton County, Va (now WVA). The fort was used in the Revolutionary War as a training grounds for our troops. The men and women of the Hinkle Fort actively participated in the training and housing of troops. Many of today;’s relatives, as you will find on Ancestry.com, have applied and been accepted into the Daughters of the American Revolution. I am also a direct descendent of Abraham Hinkle, son of Johann Justus Hinkle. For ease of purpose I’ll refer to Hinkle and all derivative spellings. First- My mother was awarded DAR acceptance during the 1980’s evidencing lineage to Johann Justus Hinkle. Last year, I decided to join and was informed that no new members were being accepted because historical military archives were searched and nothing found proving Hinkle supplied service and supplies at the fort. Is this issue being reviewed by anyone? Second – there appears to be an issue proving the marriage of Abraham Hinkle and his wife Catherine Deiter (Teter), indicating he married a Miller. However, no proof is given. When Yost Hinkle and family left NC for German Valley in Augusta Co VA, a Teter (or Dieter) family traveled with them. I understand that several Teter sons married Hinkle daughters and vice versa. I haven’t found the marriage record for Abraham and Catherine. Personally, I have not heard about the DAR issue. In our Reunion of June 2015 a presentation was made by our Historian, Dr.Greg Adamson about 3 battles fought with the British at the Hinkle Fort, the first Dec. 19, 1175, the second Aug. 13, 1778, and the last, August 17, 1778. At the last battle, John Justus Hinkle was mortally wounded and died of his wounds the next day. Per Dr. Adamson this information is chronicled in a dairy kept by Joseph Cheuvront. THe diary is a well know part of the “Forts” history and surely has been available to the DAR for many years. Richard E. Henkel, President. I have no knowledge and not being a genealogist can not comment on proving the marriage of Abraham and Catherine Dieter. Have you checked the Henckel Genealogy by Junkin and Junk? Hopefully, one of you blog reader might be of help to you on both issues mentioned. You may want to join our Association and come to a Reunion, we have many DAR members and even descendants of Abraham who probably can help you. I would love to get more information from you if possible. I have recently joined the Daughters of American Revolution with Anthony Hinkle (1754-1838) as “my” Patriot. Anthony Hinkle’s DAR number is 710342. His son, Jacob Hinkle Thoman is DAR number 236225. I descend through Anthony Hinkle->Salome Elizabeth Hinkle (Jacob Hinkle Thoman) -> Aaron S. Thoman -> Aaron B. Thoman -> Naomi Senft Thoman -> Mae Lou Houck Burke. Would be interested in sharing any info for those interested in documentation necessary for DAR. Cory, I’ve akways been interested in DAR. I’ll have to get my tree out and my direct lineage as I’m assuming that would be helpful. My great grandmother on my dad’s side was Alice Henckle (Hinkle). Please respond to my e-mail address rehenkel48@gmail.com rather than our website, otherwise it will become inundated with your e-mails. Yes, your husband is kin to relatives that served in the American Revolution! John Justice and Jacob to mention just a few. Your husband and I are pretty close relatives, my great grandfather was also David Socrates Henkel and his second cousin Rebecca was my Great Grandmother. You husbands grandfather was a bother to my Grandfather Tilden Octavius Henkel. I believe that would make us second cousins. I will be at the upcoming family reunion and look forward to seeing you and your husband there! Interestingly I am a descendent of Rev. AJ through both my mother and father. It might be nice to have a Rev. AJ Henckel descendents Facebook page or group…just a thought. Thanks for the site and the info! This is a great place to get information regarding my Hinkle heritage. However, I am one of the descendants of the slaves that Anthony Hinkle owned for 10 years before moving to NC. I hope to find the missing links to my family. It has always been weird as a African-American woman walking around with the last name Hinkle. Rachel – Have you considered the PA Archives for records. Do you know which Anthony Hinkle as the name Anthony was one of the given names that went through many generations? There was a naming habit that involved naming next generations with given names or middle names that identified some lineage link. My mother’s family continued that tradition, as did my mother and father. Aaron Senft Thoman – Aaron Bollinger Thoman – Cameron Houck Burke – etc. All middle names are the maiden name of the mother. Could you give me more information regarding the slaves Anthony Hinkle owned for 10 years before the move to NC??? I had a brief reading encounter with a small, really small, reference to slaves and I am so curious to learn more about this. If you could email me? Thanks so much for this valuable insight into the past. I found out in reading a publication from 1906 available online at University of Virginia that the grave of Rev. Anthony Hinkle was not able to be located for sure…HEAR me out here cause we know where it is now….but, earlier when the marker of his wife was located on the top upper left above all the fancy info regarding Maria were two initials just basically scratched on the surface. Those two initials were AH. So, a theory was developed that the two were buried in the same grave. And in June of 1910 ….the editor proceeded at once to St. Michael’s churchyard, Germantown. Procuring excavators and the awaited party from the city …The party together with Rev. S.A. Ziegenfuss, DD, Pastor and Dr. Frank Strepper representing the board of trustees of St. Michales gathered around the grave for observation. We gave Mr. Farrell, the excavator, the word to proceed, and he soon reached the remains of our immigrant mother, Mary Elizabeth Henkel, hardly a trace of the coffin remained, but the skeleton was fairly well preserved. The remains were carefully lifted in order to go deeper. This done, the supreme moment was at hand. Was our conclusion well founded, or was it idle fancy? Mr. Farrell ws now told to proceed very carefully, and in a few moments the remains of “the Exiled” (Anthony) court preacher and the foundr of the Lutheran churches in Germantown and Philadelphia were reached. The remains were carefully placed in a box and re-interred. The editor offered a prayer and Benediction and the party then proceeded to the Mermaid Inn…for lunch. They were re-interred nearer to the church on the sidewalk to the main door where they remain today. Just so you have the full story of the burial…it was a hunch by the editor that lead them to figure out that the two were buried in the same grave all along. Remember that this article is from the early 1900s..1910 was when the graves were excavated so….put the article in that perspective. Thank you for the information concerning Anthony Jacob Henckel and his wife Maria. I have read a very similar account of the new and old grave at St. Michael’s Lutheran. You initially refer to Anthony Hinkle, Anthony Jacob Henckel did hot change the spelling of his name it was done initially by Anthony Jacobs son, John Justus Henckel (nee Hinkle) and then in turn by John Justus’ his son Jacob. I have never heard anything about any of them owning slaves. That not to say they did not own them. If you find concrete evidence please let us hear from you. If you are not a member of our Association please join us. We need people that enjoy research on our family. I am also a grandson of Paul Henkel, he and his wife Elizabeth were great, great, great, great grandparents of mine. Notice even though Paul was a son of Jacob and Barbara Hinkle, he changed the spelling of his name to Henkel. Mine is spelled the same and I have always wondered why my branch of the families name was not changed to Hinkle. The re-interred story of Anthony Jacob Henckel and his wife Maria is wonderful information and needs to be kept alive. Too bad there were no pictures taken of the event. I am an African-American woman with the last name Hinkle. I think I as well as my family which lived in Kentucky, Pennsylvania and North Carolina is proof enough that I am a descendant of the slaves that were owned by Anthony. We are all very fair skinned and some of my relatives were even allowed to pass for white people. In my research I have found that the Hinkle Family were very well known. Regardless to if it was a small reference or “really small” reference to the owning of slaves, the fact is he owned them and I am the proof that he owned them. Whatever was built or achieved in the Hinkle Family, we played a huge part in it…..by force. Rachel, we appreciate your comments and encourage you to join our Association, we can learn together about how our families survived those different times in our country’s history. Thank you so much for your comments. It’s wonderful and exciting that you are looking into your family history. You ARE very much a part of the Henckel/Hinkle History. My suggestion is to do your DNA. Ancestry.com is excellent if you have put up a family tree with as must information as you can find to make connections and also FamilySearch.com. I am a descendent of Anthony Hinkle as well. With several generations having lived in Lexington N.C., my father is Thomas Carl Hinkle III (born Lexington NC), and we now live in British Columbia, Canada. I have always wondered about the history of slaves in the Hinkle family tree, as nobody in my family ever brought it up. Now that I am a father, I would like to ensure that my daughter learns about this part of our family’s history as well. I have always wanted to meet and speak with descendants like yourself. If you would be interested in getting in touch, I would love to hear from you. If anyone else on this board has links to source documents regarding slave ownership, I would appreciate the links. Anthony is my 9th great grandfather. My line is Anthony – Jacob – Charles – Casper – Mathias – Solomon – Pleasant – Berlin – Homer – Oren – Vickie. My direct line found its way to Oklahoma. Very surprised to find this website. Well done!!! Mr Richard Henkel, I have researched my family since 2003. Anthony – Jacob – Anthony III – Nathan – William – Elijah – Edward – Walter C. – Walter L. – . I live in Enid, Oklahoma and have had some correspondence with Nedra Brill in those early years, even sending her copies of mine and a Mr Howell’s research.This has some good information on Nathans son William as he moved from Cumberland Cty, KY to ST. Clair Cty. MO. and those descendants. I have been fortunate to take my family to see St. Michaels in Germantown and have also seen Nathans statue at Hymera Ind. cemetery. I was receiving a newsletter but haven’t had one in several years and would like to be back on mailing list please. Also Nedra had told me of volumes of bulletins that were available at a cost, I’m still interested in knowing how I might obtain copies please. I was glad to find this website. Rev. Anthony Jacob was my 9th generation ancestor (A.J. > John Justus > Anna Maria Elizabeth m. Moses Ellsworth > Elizabeth m. Joseph Cheuvront > Amos > Mary Jane m. John Lockhart > Squire > Yancy > John Richard > me). Also Rev. Paul Henckel presided at the marriage of my g-g-g-grandparents Isaac Lockhart & Sarah Sheppard in 1812. Currently living in Massachusetts with my wife and 2 sons. Thank you for your comments. It always great to hear from relatives all over the country. Maybe you will be able to join us in Philadelphia in 1717, to celebrate our families journey to America. Richard Henkel, Webmaster. My line is Rev Anthony Anthonius Henckel 1668-1728 spouse Maria Elizabeth Dentzer 1671-1741 their son -Johann Justus Henckel 1706-1778 spouse Maria Magdalena Eschmann 1710-1798 their daughter-Anna Maria Elizabeth Henckel 1731-1824 her spouse was Moses Henry Ellsworth 1731-1802 their daughter Hannah Ellsworth married Isaac Bennett 1750-1790 their son Jesse Bennett 1781 Pennsylvania, USA-1813 – died 1813 York County, Ontario, Canada his spouse Anna Catharine Cober 1781-1869 their daughter Catherine Bennett 1809-1895 married Jacob Baker dates and buried in Ontario, Canada ? their youngest son Ezra Baker married Sarah Lowry buried in Maplewood cemetery, Grey County, Ontario, Canadal- their son George Ezra Baker died in 1952 buried under name Becker in Durham Cemetery in West Grey, Grey County, Ontario, Canada and his spouse Emily Florence Delinah Baker – their son Norman Wellington Becker and spouse Ina Mae MacDonald (also buried in Durham, Grey County, Ontario, Canada) their daughter Sheila Becker spouse Pat Garvey their daughter Kim Garvey (me). Hoping to hear from other decendants and I am trying to work on family tree and would love to get information and pictures ect.. Hoping to get down to USA to see everything some day. Would be nice to find other descendants to go with from Ontario, Canada also. I am a descendant of the Henkel family also!!! I live in Ontario, Canada. Rev. Jacob Anthony is my 8th great-grandfather. I am related through branch 6. I was doing some research over the weekend on Ancestry.com and I discovered that I am also related to Robert “King” Carter, who was a rich Virginian and governor for awhile and Nathaniel Bacon Burwell, who married “King” Carter’s daughter and was a member of another prominent Virginia family. The families are connected because a Burwell daughter married a Hale son, and their grandson married Phoebe Hinkle, who was the 2nd great-granddaughter of Rev. Henckel. I live only about an hour from where a lot of these people are buried and I plan to take a drive up there soon. I am going to use this info to apply for membership for the Jamestowne Society. I love reading about our family. Every time I discover a new connection or read about a battle someone fought in and I tell my family, my mom says “what did a Henckel do now?!? !” Feel free to email me at lnhawkins@yahoo.com. Thank you, I will spread the word of your website and intend to join right away. I am descendant of John Justus Henckel line. My 4th Great-Grandfather, Johannes Adam Biffle, (1728) was married to Catherine Henckle. My Grandmother, Elizabeth Jane Grimes Kennedy’s mother was Ellen Elizabeth Biffle. My 4th Great-Grandfather, Johannes Adam Biffle, was married to Catherine Henckle. I recently learned this. My German husband will be glad to know I’m of German heritage. This is truly wonderful that an Association for The Henckle/Hinkle has been created. I don’t know for sure, but Ancestry.com says that AJ is my 9th Great Grandfather. Pretty cool if true. Nice site. Anyone else with pics? I have some more pictures from Germantown. I went to see the church for the first time this past August. Very pretty! If you would like to see those, you can email me at lnhawkins@yahoo.com. What a great opportunity to meet up with relatives. My great grandmother was Alice Hinkle (married Oscar Judy) from the Rough Run area in Grant County/Pendleton County in West Virginia. Was fortunate to run into Ron Hinkle (WV glass blower) as an exhibit that he had done several years back at the museum at the state capitol in Charleston, WV. Looking forward to meeting more relatives. Will definately share this site with my three siblings, their children, as well as my cousins. I was glad to see you information in here, my husband is the grandson of Daniel Webster Hinkle. We are researching the Hinkle family and have gotten to some information on Alice and Oscar. My husband is Charles C Hinkle of Petersburg WV, his dad was Charles A Hinkle who had the barber shop in Petersburg. He bought his tires from Ralph Kesner in Petersburg. We would love to talk with you. Were your grandparents Glenna Alice Judy and Lester David? Ralph Kesner is my dad and he had the Exxon and Chevron stations. Yes, Glenna Alice Judy and Lester David Kesner are my grandparents. I’ve been told I look very much like grandmother. I have 2 brothers (Bradley Clinton and Brent Karleton) and one sister, Nicki Lane. I live Iin California, Brad kives in Roanoke, Brent lives in Charleston and Nicki lives in Barboursville (close to Huntington). I have 3 paternal cousins: Mike Sites (son of Linton Sites and Jean Kesner Sites) and Paula and Donna (daughters of Paul and Helen Kesner). What cemetery is Glenna Alice and Oscar Judy and your parents buried in? This fine web page is well thought out and assures that the Henckel name will go on through history. I have informed my relatives of this adress and sent out two Big Red Book giving the page numbers that apply to them. I am a descendant of Reverend Anthony Jacob Henckel and through Johann Justice Sr. is my line. Well done. I am also a descendant of Anton Jacob Henckel. I am working on getting the information together but I think one of his sons married Elizabeth Levering of Roxborough, PA and they then moved to Hanover, PA. Their daughter, Elizabeth Henckel, married William Hart in Augusta County, VA in the late 1700’s and they moved to the Louisville, KY, area in the 1790’s. He died in the early 1800’s and she remarried. Their son, Samuel Miller Hart, was my great grandfather. I have not been able to trace the Harts back farther than their marriage in VA., but my aunts used to say the Harts at one time owned land in downtown Baltimore.